The INBOUND conference has grown into a massive event by any standard. The number of participants this year was more than 24,000, and the Boston convention centre felt quite crowded. While the conference keynote hall is massive, people were still struggling to find a place at some of the most popular keynotes. Nevertheless, our impression was that the event was very well planned and a smooth registration process, session planning, and food delivery service made the whole thing seem very manageable. At this year's INBOUND conference , HubSpot unveiled the largest set of new products the company has ever released at once. The main message was that it is all about focusing on creating a smoother and better customer journey. In their traditional keynote presentation, Hubspot founders Brian Halligan and Darmesh Shah focused primarily on getting rid of friction in the customer experience. Here at Zooma we've talked about creating effortless simplicity for customer for quite some time (which is another way of expressing the same point). Needless to say, the HubSpot message on this resonated well with us. 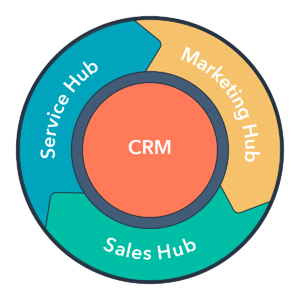 HubSpot now has a full circle software suite offering with the newly released Service Hub, adding to the existing Marketing Hub and Sales Hub. 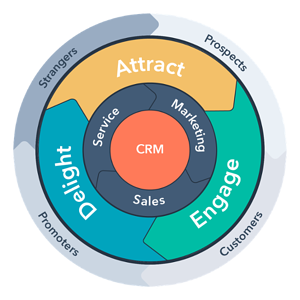 As a result, HubSpot is pushing focus towards customer service—or the delight phase of the inbound journey—concluding that what is key to achieving business growth today is turning average customers into active promoters. The traditional inbound funnel is therefor retired, as HubSpot now promotes the Inbound Flywheel to describe the future growth model. The idea is that by committing to removing friction (or create effortless simplicity) throughout the customer journey, you can get the "wheel" to turn smoother and faster—thereby growing and retaining your customer base more efficiently. Note that a fundamental prerequisite for this is to always look from the outside, i.e. always start from the perspective of the customer (or persona) at all stages in the customer lifecycle. In conjunction with this, HubSpot also announced advanced capabilities in their new Enterprise suite. This is meant to offer better scalability and better support the needs of large companies and sophisticated teams. It will include improved analytics and custom bot building, advanced team management; a native Slack integration; machine learning to power features like predictive lead scoring; and HubSpot’s recently released Conversations tool, which is available to all customers and unites email, chat, and social in one inbox. Additionally, new features, including hierarchical teams, health scoring, advanced content partitioning, and workflow extensions, is expected to be released in the coming months. The main learning from this year's INBOUND is not really new but always worth repeating and constantly re-learning. It is that we should all become better at looking at the full customer experience throughout the life cycle! It is also one of the main obstacles you need to overcome to achieve digital transformation. Fundamentally, this years event also reaffirmed our deep held belief in always looking from the outside and to create effortless simplicity for customers. Today many companies resources--both when it comes to infrastructure and organisation--are invested primarily in making the front-line employees more efficient. Instead you should strive towards having a 80/20 ratio where about 80% of your resources are devoted to making your customers more efficient. Delight is the new Attract! Don’t forget your existing customers! They will attract new customers if handled correctly. A first step is usually to get a grip on what customers actually think about your company by implementing a Net Promoter Score (NPS) survey.